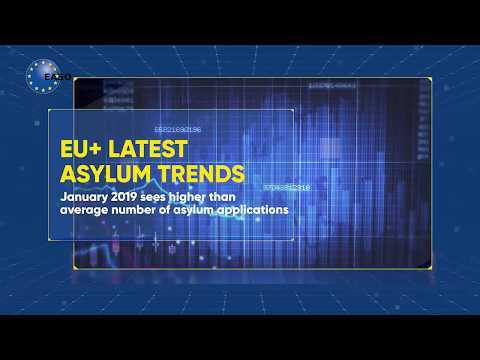 The European Asylum Support Office (EASO) has published data on asylum trends in the EU+ in 2017 on a newly enhanced interactive portal. The results show a significant decrease in lodged applications for asylum compared with 2016, with 40% of decisions in 2017 being positive. In 2017, EU+ countries recorded 706,913 asylum applications [I]. This is a decrease of 43% compared to 2016, and the second consecutive year with fewer applications after the unprecedented influx in 2015 and 2016. Despite this decrease, the 2017 total remained at a slightly higher level than the number of applications lodged in 2014, indicating that the asylum-related inflow in the EU+ remained considerable. In the EU+ as a whole, monthly applications remained stable throughout the year.The monthly number of applications varied from 49,042 in December to 66,443 in March. A seasonal trend, with higher numbers of applications over the summer, was less visible than in the previous three years. The stable trend at EU+ level, however, conceals stark variations at a country level. About 55,000 applications, or 8% of the total, were repeated applications by persons who had already lodged an application previously in the same EU+ country. At least 3.5 % of all applications concerned claimed unaccompanied minors (UAM)[II]. Syria was the most common country of origin of applicants for the fifth consecutive year, with more than 98,000 applications. Despite a considerable decrease compared to 2016, twice as many Syrians lodged an application for international protection in the EU+ as any other citizenship. Iraqi, Afghan and Nigerian nationals each lodged more than 40,000 applications in 2017. These four main countries of origin together constituted one in three applications throughout the EU+ in 2017. The top ten countries of origin also included Pakistan, Eritrea, Albania, Bangladesh, Guinea and Iran. Of these ten citizenships, only Bangladeshi and Guinean citizens lodged more applications in the EU+ in 2017 than in 2016. In 2017, EU+ countries issued 981,615 decisions at first instance, 13% fewer than in 2016 [III]. Despite the decrease, this was the second highest number of first instance decisions ever issued at a European level since data collection began in 2008 [IV]. In the EU+ as a whole, 40% of all decisions in first instance were positive[V]. This recognition rate was 17 percentage points lower than in 2016, a decrease which reflects the combined effect of a higher number of decisions issued on cases with relatively lower recognition rates (such as Afghanistan, Nigeria and Pakistan) and the concurrent decrease in the number of decisions issued to Syrian and Eritrean nationals, which are characterised by higher recognition rates. At the end of 2017, there were 462,532 applications awaiting a decision in first instance [VI].This is half the number of cases that were pending at the end of 2016 as a result of more first-instance decisions being issued in 2017 than asylum applications lodged. This decrease was reflected in most EU+ countries. Coinciding with the publication of the data for 2017, EASO has launched a newly enhanced and interactive portal that allows for the general public and stakeholders to easily source customised information and data relating to asylum trends in the EU+. The data will be updated on a monthly basis. [I] The EU+ is composed of 28 EU Member States plus Norway and Switzerland. Data on applications for international protection were available for all 30 EU+ countries. Some monthly data were missing and these are estimated to represent approximately 1,000 applications. [II] Claimed UAMs represent the asylum applicants claiming to be below the age of 18 years rather than those assessed to be such after an age assessment has been carried out. Several EU+ countries have difficulties reporting on claimed UAMs in the framework of the EPS data exchange. These figures should therefore be considered as underestimations of the actual proportion of claimed UAMs. [III] Data on first-instance decisions were available for all 30 EU+ countries. Some monthly data were missing. [IV] When Eurostat started to collect information on asylum decisions. [V] The EU+ recognition rate includes EU-regulated forms of protection (refugee status and subsidiary protection) and excludes national protection forms (humanitarian reasons). It is calculated by dividing the number of positive first-instance decisions (granting refugee status or subsidiary protection) by the total number of decisions issued. [VI] Data on pending cases were available for 29 EU+ countries. Some monthly data were missing.